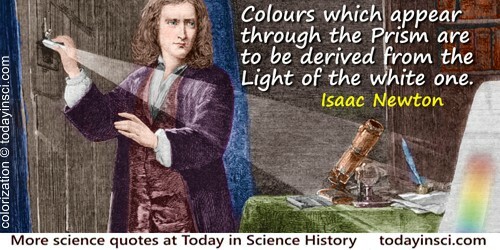 And if one look through a Prism upon a white Object encompassed with blackness or darkness, the reason of the Colours arising on the edges is much the same, as will appear to one that shall a little consider it. If a black Object be encompassed with a white one, the Colours which appear through the Prism are to be derived from the Light of the white one, spreading into the Regions of the black, and therefore they appear in a contrary order to that, when a white Object is surrounded with black. And the same is to be understood when an Object is viewed, whose parts are some of them less luminous than others. For in the borders of the more and less luminous Parts, Colours ought always by the same Principles to arise from the Excess of the Light of the more luminous, and to be of the same kind as if the darker parts were black, but yet to be more faint and dilute. Opticks (1704), Book I, Part 2, Prop. VIII, Prob. III, 123. Webmaster is not alone in failing to find a primary source. Regardless of how widely quoted, the few citations to be found merely reference other books in which it is stated without a valid citation. For example, this quote is an epigraph in Eric Middleton, The New Flatlanders (2007), 19, with a note (p.151) citing Niels Bohr, Atomic Physics and Human Knowledge (1958), but Webmaster’s search of that text does not find it. If you know the primary source, or an early citation, please contact Webmaster. As, no matter what cunning system of checks we devise, we must in the end trust some one whom we do not check, but to whom we give unreserved confidence, so there is a point at which the understanding and mental processes must be taken as understood without further question or definition in words. And I should say that this point should be fixed pretty early in the discussion. Samuel Butler, Henry Festing Jones (ed. ), The Note-Books of Samuel Butler (1917), 220-221. As described in Brian Stableford, Science Fact and Science Fiction: An Encyclopedia (2006), 150. But, but, but … if anybody says he can think about quantum theory without getting giddy it merely shows that he hasn’t understood the first thing about it! Quoted in Otto R. Frisch, What Little I Remember (1979), 95. In 'The Critic: Or, A Tragedy Rehearsed', Act 1, Scene 2, as collected in Thomas Moore (ed. ), The Works of the Late Right Honourable Richard Brinsley Sheridan (1833), 181. In 'The Queen of mathematics', The World of Mathematics (1956), 515. In 'Confessio Fidei', collected in Outspoken Essays: Second Series (1922), 24. I then shouted into M [the mouthpiece] the following sentence: “Mr. Watson—Come here—I want to see you.” To my delight he came and declared that he had heard and understood what I said. I asked him to repeat the words. He answered “You said—‘Mr. 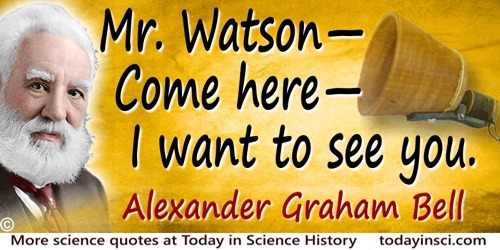 Watson—-come here—I want to see you.’” We then changed places and I listened at S [the reed receiver] while Mr. Watson read a few passages from a book into the mouth piece M. It was certainly the case that articulate sounds proceeded from S. The effect was loud but indistinct and muffled. If I had read beforehand the passage given by Mr. Watson I should have recognized every word. As it was I could not make out the sense—but an occasional word here and there was quite distinct. I made out “to” and “out” and “further”; and finally the sentence “Mr. Bell do you understand what I say? Do—you—un—der—stand—what—I—say” came quite clearly and intelligibly. No sound was audible when the armature S was removed. Notebook, 'Experiments made by A. Graham Bell, vol. I'. Entry for 10 March 1876. 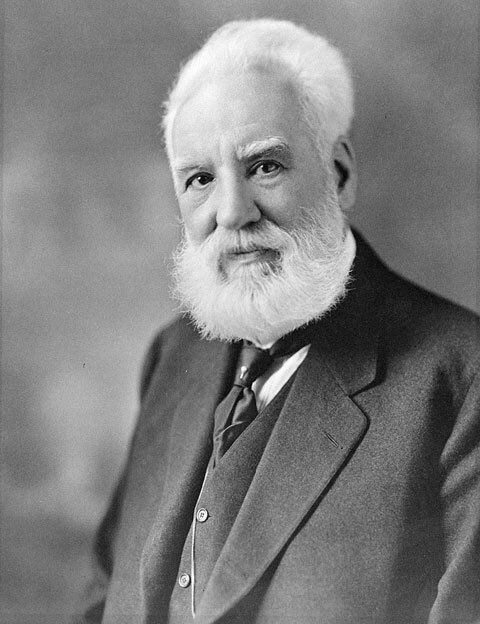 Quoted in Robert V. Bruce, Bell: Alexander Graham Bell and the Conquest of Solitude (1973), 181. I would like to be rather more special, and I would like to be understood in an honest way rather than in a vague way. In The Character of Physical Law (1965, 2001), 13. As quoted, without citation, in Ronald Keast, Dancing in the Dark: The Waltz in Wonder of Quantum Metaphysics (2009), 104-105. If you know a primary source, please contact Webmaster. Mutual Aid: A Factor of Evolution (1902), 293. It is in moments of illness that we are compelled to recognize that we live not alone but chained to a creature of a different kingdom, whole worlds apart, who has no knowledge of us, and by whom it is impossible to make ourselves understood: our body. It must be understood that prime matter, and form as well, is neither generated nor corrupted, because every generation is from something to something. Now that from which generation proceeds is matter, and that to which it proceeds is form. So that, if matter or form were generated, there would be a matter for matter and a form for form, endlessly. Whence, there is generation only of the composite, properly speaking. De Principiis Naturae (On the Principles of Nature) [before 1256], Chap. 2, Sec. 12, trans. J. Bobik, Aquinas on Nature and Form and the Elements: A Translation and Interpretation of the de Principiis Naturae and the De Mixtione Elementorum of St. Thomas Aquinas (1998), 29. Alternate translation: “We should note that prime matter, and even form, are neither generated nor corrupted, inasmuch as every generation is from something to something. That from which generation arises is matter; that to which it proceeds is form. If, therefore, matter and form were generated, there would have to be a matter of matter and a form of form ad infinitum. Hence, properly speaking, only composites are generated.” In Forrest E. Baird and Walter Arnold Kaufmann, Philosophic Classics: Volume II: Medieval Philosophy (1997), 398. It ought ... to be understood that no one can be a good physician who has no idea of surgical operations, and that a surgeon is nothing if ignorant of medicine. In a word, one must be familiar with both departments of medicine. Little can be understood of even the simplest phenomena of nature without some knowledge of mathematics, and the attempt to penetrate deeper into the mysteries of nature compels simultaneous development of the mathematical processes. In Teaching of Mathematics in the Elementary and the Secondary School (1906), 16. Mathematical language is not only the simplest and most easily understood of any, but the shortest also. In Works of Henry, Lord Brougham: Vol. 7: Rhetorical and literary Dissertions and Addresses (1856), 317, footnote. Mathematicians seem to have no difficulty in creating new concepts faster than the old ones become well understood. Acceptance Speech for the Kyoto Prize (1991), 'A scientist by choice'. On kyotoprize.org website. Mathematics, too, is a language, and as concerns its structure and content it is the most perfect language which exists, superior to any vernacular; indeed, since it is understood by every people, mathematics may be called the language of languages. Through it, as it were, nature herself speaks; through it the Creator of the world has spoken, and through it the Preserver of the world continues to speak. Nature is never so admired as when she is understood. Prefacé sur l'utilité des mathématiques et de la physique (1733), in Oeuvres, Vol. 5, 11. Trans. John Heilbron, Electricity in the 17th and 18th Centuries: A Study of Early Modern Physics (1979), 43. The Red Man's Continent: A Chronicle of Aboriginal America (1919), 88. Primary source uncertain. Found widely quoted as two sentences, without citation. For example, in Larry Chang, Wisdom for the Soul (2006), 304. If you have a primary source, please contact Webmaster, who has not yet found it in any large collection or biography, but has seen it mentioned without citation in many books as far back as 1952. Webmaster doubts that the second sentence is by Curie. The quote appears in a 1968 publication as the conclusion of an article, and only the first sentence is given in quotes. The second sentence is outside the quotes. See Glenn T. Seaborg, 'Need We Fear Our Nuclear Future? ', Bulletin of the Atomic Scientists (Jan 1968), 24, No. 1, 42. Seaborg's article title, on page 36, is followed by the first sentence only, in quotes, citing Maria Sklodowska-Curie. His article condenses the speech he gave before a symposium in celebration of the Maria Sklodowska-Curie Centenary held in Warsaw, Poland (19 Oct 1967). The first sentence, alone, appears in French as «On ne doit rien craindre dans la vie—il suffit de comprendre,» in Université Laval, Faculté de médecine, Société medicale des hôpitaux universitaires de Québec, Laval médical (1951), 16, 569. 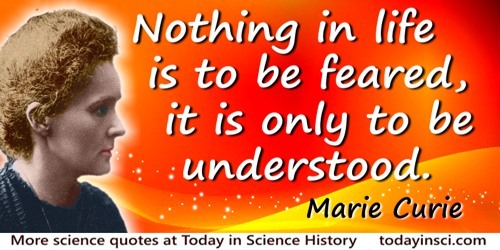 This French source gives as context Marie Curie's discovery that she had cancer. The second sentence does not easily share that context, so the Webmaster believes it is solely the words of Glenn T. Seaborg, belonging only as a concluding remark to his article. Nothing in this world is to be feared … only understood. Primates stand at a turning point in the course of evolution. Primates are to the biologist what viruses are to the biochemist. They can be analysed and partly understood according to the rules of a simpler discipline, but they also present another level of complexity: viruses are living chemicals, and primates are animals who love and hate and think. 'The Evolution of Primate Behavior: A survey of the primate order traces the progressive development of intelligence as a way of life', American Scientist (1985), 73, 288. 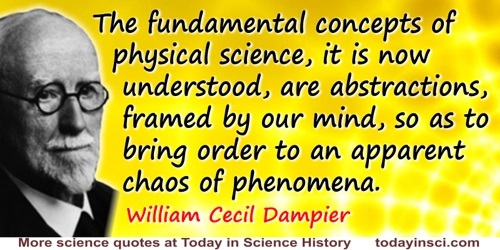 Science has to be understood in its broadest sense, as a method for apprehending all observable reality, and not merely as an instrument for acquiring specialized knowledge. In Alfred Armand Montapert, Words of Wisdom to Live By: An Encyclopedia of Wisdom in Condensed Form (1986), 217, without citation. If you know the primary source, please contact Webmaster. The maladies that affect the clerks aforesaid arise from three causes. First, constant sitting, secondly, the incessant movement of the the hand and always in the same direction, thirdly, the strain on the mind from the effort not to disfigure the books by errors or cause loss to their employers when they add, subtract, or do other sums in arithmetic. The diseases brought about by sitting constantly are easily understood; they are obstructions of the viscera, e.g. the liver and spleen, indigestion in the stomach, numbness of the legs, a considerable hindrance in the circulation of the blood, and an unhealthy habit. De Morbis Artificum (1713), supplement, ch. 2, translated by W.C. Wright (1964). The method of arithmetical teaching is perhaps the best understood of any of the methods concerned with elementary studies. In Education as a Science (1879), 288. 'Knowledge or Certainty,' episode 11, The Ascent of Man (1972), BBC TV series. From Force and Matter: Or, Principles of the Natural Order of the Universe (1884), Preface to the 15th edition, x. 'Why Mathematics Grows', Journal of the History of Ideas (Jan-Mar 1965), 26, No. 1, 4. In Salomon Bochner and Robert Clifford Gunning (ed.) Collected Papers of Salomon Bochner (1992), Vol. 4, 192. There are but few saints among scientists, as among other men, but truth itself is a goal comparable to sanctity. As the Pythagoreans had already understood it more than twenty-four centuries ago, there is sanctity in pure knowledge, as there is in pure beauty, and the disinterested quest of truth is perhaps the greatest purification. 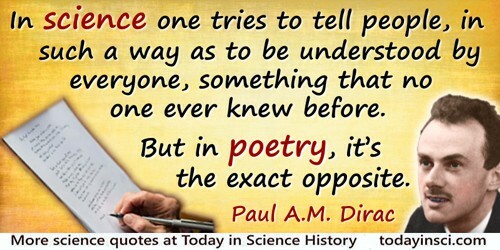 In The History of Science and the New Humanism (1987), 46-47. There are no deep theorems—only theorems that we have not understood very well. In 'Reflections on Bishops Philosophy of Mathematics', Constructive Mathematics: Proceedings of the New Mexico State University Conference Held at Las Cruces, New Mexico, August 11-15, 1980 (1981), 137. 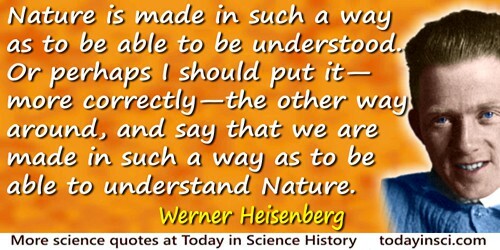 We intend to say something about the structure of the atom but lack a language in which we can make ourselves understood. We are in much the same position as a sailor, marooned on a remote island where conditions differ radically from anything he has ever known and where, to make things worse, the natives speak a completely alien tongue. In conversation during first meeting with Werner Heisenberg (summer 1920), as quoted in William H. Cropper, Great Physicists: The Life and Times of Leading Physicists from Galileo to Hawking (2001), 249-250. We often observe in lawyers, who as Quicquid agunt homines is the matter of law suits, are sometimes obliged to pick up a temporary knowledge of an art or science, of which they understood nothing till their brief was delivered, and appear to be much masters of it. What Art was to the ancient world, Science is to the modern: the distinctive faculty. In the minds of men the useful has succeeded to the beautiful. Instead of the city of the Violet Crown, a Lancashire village has expanded into a mighty region of factories and warehouses. Yet, rightly understood, Manchester is as great a human exploit; as Athens. In Coningsby: Or The New Generation (1844), Vol. 2, Book 4, Ch.1, 2.